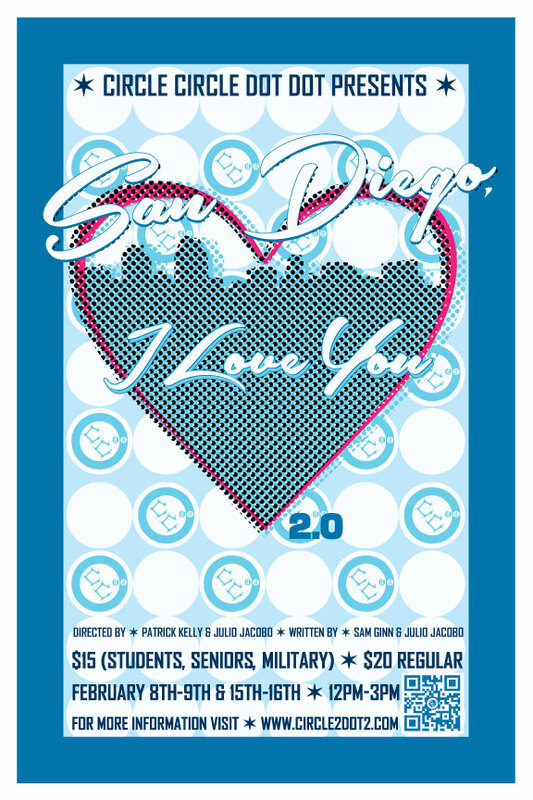 Announcing: "San Diego, I Love You 2.0"
"San Diego, I Love You 2.0"
Performances: February 8th, 9th, 15th, 16th. Performance Times: 1:00, 1:30, 2:00, 2:30, 3:00, 3:30pm. Need a little more romance in your life this February? Then throw on some comfortable shoes and join Circle Circle dot dot for the newest edition of our critically-acclaimed romantic performance adventure to get your fill! "San Diego, I Love You 2.0" is a site-specific production that plays with/in the neighborhoods of our beautiful city. Audiences will meet us this year in University Heights to be guided to several secret locations to watch the love story of Grace and Chuck unfold. This year's piece dissects the complexities of falling for someone in the military, and the incredible sacrifices made in the name of love. Join us for another wonderful journey towards happily ever after! Lia Peros, Michael Parrott, Ashley Toolan*, Ryan Kidd, Crystal Mercado, Jyl Kaneshiro, Durwood Murray, Kathi Copeland, and John Whitley-Gibson. 1, 1:30, 2, 2:30, 3, 3:30pm each performance day. This production has very limited audience space as only 10 tickets per showtime will be made available to purchase in order to help enhance the performance experience for our audiences. We strongly suggest purchasing tickets before the event! HOW TO BUY TICKETS: Tickets for SAN DIEGO, I LOVE YOU 2.0 are available only atwww.circle2dot2.com before the show, or by e-mailing circle@circle2dot2.com to arrange reservations. Tickets may also be purchased a half an hour prior to each performance at starting location (Bourbon St. Bar).